How Friends & Strangers Shaped My Style, by Andrea Linett. Who of us hasn't noticed a particularly chic and confident woman and wondered what it would be like to walk in her shoes? 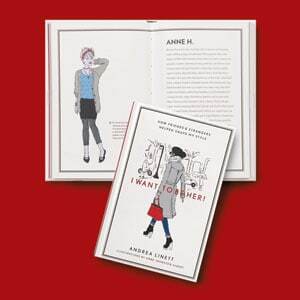 This unconventional little book charts the development of fashion stylist/writer/ director Andrea Linett's personal style via the women whose looks she admired from her childhood to the present. From her mom, a powerful career woman with an Annie Hall–like aesthetic, to a scantily clad older woman she saw on a beach, Linett relates the fashion ideas and tips--as well as life lessons--she's amassed over the years from friends and family, strangers and celebrities. Anne Johnston Albert's winsome illustrations add to the charm of it all. Trend-watchers as well as those whose style could use a reboot will treasure this lighthearted and inspirational fashion memoir. What I notice first about this book is that the author and I must be close to the same age as she references looks that I tried, too. Sadly, most of my looks have been complete failures! While I certainly do not consider myself a trendsetter or fashionista of any sort, this was such a fun little book. The drawings are quite extraordinary. I enjoyed this journey through the author's closet from child to adult. It is a quick, playful read. If I were to write a similar book, I would have to include Patty's blog, Not Dead Yet Style, and the many inspiring looks from her link party, Visible Monday! It sounds like a fun book and subject that many women can relate to. Thanks for sharing! Interesting sounding book. Thanks for sharing! Definitely putting that on my to look at and read list! Thanks for the tip! I'm one of Patti's Visibles. Thanks for the recommendation - I love style books. Thanks for sharing with Visible Monday, too! Yes, this one is on my Kindle wish list. So many books, so little time (and money!) Soon. Very soon.